The Great White Box (as I call this style) is slowly but inexorably transforming where I live. Its cookie-cutter looks and the astronomical prices it commands—most recent peak: $2.8 million—have filled me with wonder. All the boxes near me were built on spec by a constellation of individuals, companies, and mysterious LLCs. How had they all simultaneously decided to build nearly identical houses? In a city where the median home price is about $700,000 and median household income less than $58,000, that’s a 5-percenter question for sure (though—as GWBs spread through Venice, Mar Vista, south Santa Monica, Culver City, West Hollywood, Beverly Grove, and even parts of Portland, Seattle, and Vancouver—not an idle one). It’s pretty clear how a fashion craze takes off: A model or celebrity wears a dress, TV and Instagram explode with images of it, H&M cranks out a version for $29.95. But who and what was behind this architectural steamroller? What human first gazed down the block of an aging postwar tract, slapped his or her forehead, and shouted, “By God, what this place needs is a box!”? The GWB seems not to have been planned as much as to have materialized out of a powerful cultural-economic convergence—think of those spots in the ocean where opposing currents smack to create monster waves. Building big is nothing new. Homes in L.A., as in the rest of the U.S., have been expanding for decades, even as the number of people who inhabit them shrinks. In 1950 the average single-family American home was just 983 square feet. And even the latest round of local fighting over how big is too big is more than a decade old. The urge to demolish older homes and replace them with something grander spikes during economic booms; cases in point, the 1990s and early 2000s. 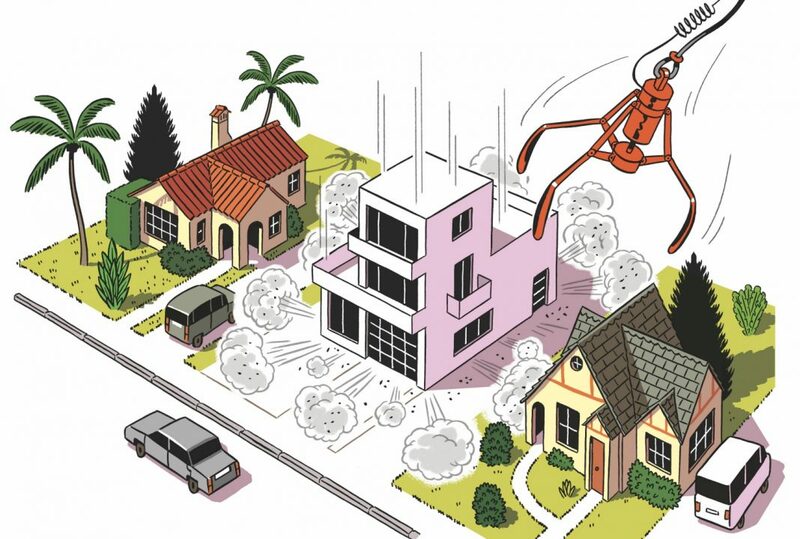 In 2001 the Los Angeles Times reported that a recent demolition binge of 1,211 homes per year, or around three a day, had created a new sort of “ghost town in the city.” Stupendous, architecturally ambiguous McMansions replaced those specters, especially in some of L.A.’s pricier neighborhoods. In 2008 pushback from preservationists and neighbors left in shadow led the city to pass a “Baseline Mansionization Ordinance,” which aimed to put some limits on home-to-lot ratios. Tweaks and updates to the ordinance followed in subsequent years, each igniting fresh debate. Since developers monitor what sells, these spec houses share a pattern, though three dominant variants seem to have emerged: the Cape Cod, with a steeply pitched roof and “coastal” feel; the Modern Farmhouse (slightly more rustic); and the GWB. All are white, feature open floor plans, and hit new levels of gigantitude. When the anti-mansionization movement began, the median size of a new L.A. home was 3,520 square feet; that’s where these babies start. But when 8,000 homes have been torn down to make way for updated models, and the point is return on investment (not artistic vision), rich, deep, and thoughtful is not a viable option. It’s not as easy as you might imagine to make money on a spec house, longtime Westside realtor Ron Wynn told me. He explained the economics: Take the cost of the teardown, the price of construction, the interest on the cash you must borrow to buy and build, and closing costs/commissions for selling the finished product—and putting up a 3,000-square-foot house in a hot Westside neighborhood will quickly set you back a few million. If you want to turn a respectable profit, you need to build something that goes up smoothly and sells fast. A cube is simple to construct, can be plopped almost anywhere, and accommodates the requisite bells and whistles an upwardly mobile buyer demands: en suite bathrooms, big closets, a kitchen full of gleaming quartz and chrome. Standardized plans and inexpensive finishes also save money. Earlier this year I went to open houses at two nearby GWBs, asking prices $2.3 million and $2.7 million. They were big, blandly pleasant spaces, pale wood floors and a palette of black, white, and cream. Every bedroom had a walk-in closet and a bath, and the two master baths were huge, each with a freestanding soaking tub. Multiple sliding doors opened to rooftop decks and rear yards. It was churlish of me—who couldn’t afford either house—to notice the cheapness of the windows, the stark, treeless landscapes. One home’s second-floor deck offered a view of the 10 freeway. Whatever. A GWB that set neighborhood price records in 2015 sold again this year for $300,000 more. A five-minute walk away, a tiny pink ’50s house with a bay window had sold in nine days for $1.27 million, and the construction fence with a demolition notice was already up. Previous articleNovember’s Best Showings of Classic Movies in L.A.